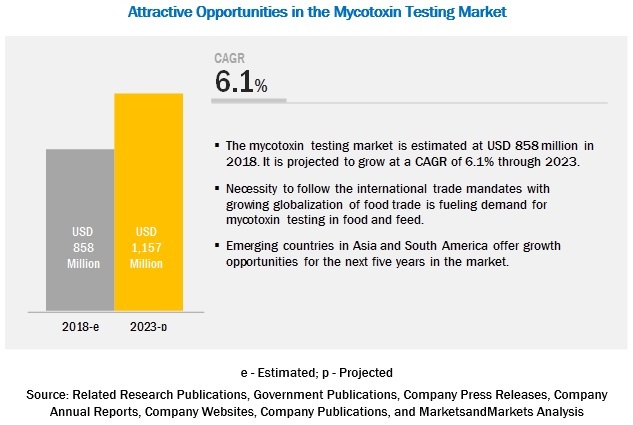 [278 Pages report] The global mycotoxin testing market is estimated to be valued at USD 858 million in 2018 and is projected to reach USD 1,157 million by 2023, at a CAGR of 6.1%. Increase in instances of foodborne illness due to mycotoxin contamination, growth in demand for compliance with international trade mandates and change in atmospheric conditions are some factors driving the growth in the mycotoxin testing market. Food samples are tested more often for the presence of mycotoxins. The presence of mycotoxins in food can have toxic effects on the host such as immunosuppression, irritable skin, birth defects, and neurotoxicity. Mycotoxins in the food and feed supply chain pose significant economic losses in international trade and also impacts the human health. They cannot be destroyed using conventional food processing techniques, and hence, the food samples tested are directly from the farm items. The aflatoxins segment is estimated to account for the largest market share in the mycotoxin testing market due to its high prevalence in the agricultural products, which are used for human consumption such as corn, peanuts, groundnuts, cotton seeds, and tree nuts. According to the World Health Organization (WHO), the presence of aflatoxins leads to about 25% of the world’s food crops to be destroyed every year, thereby making it the most potent among all other toxins. The dominance of the chromatography- & spectroscopy-based segment is due to the introduction of faster liquid chromatography (LC) technologies for high-performance liquid chromatography (HPLC). Fast LC systems offer various advantages, such as superior resolution, high sensitivity, and enhanced throughput to research laboratories. It is comparatively a more effective tool than immunoassay-based methods. Europe accounted for share of 39.1% in 2017 in the mycotoxin testing market. The food and feed testing mycotoxin policies have been strengthened by the contributed efforts from control laboratories (CLs), national reference laboratories (NRLs), and EU reference laboratories (EURLs). 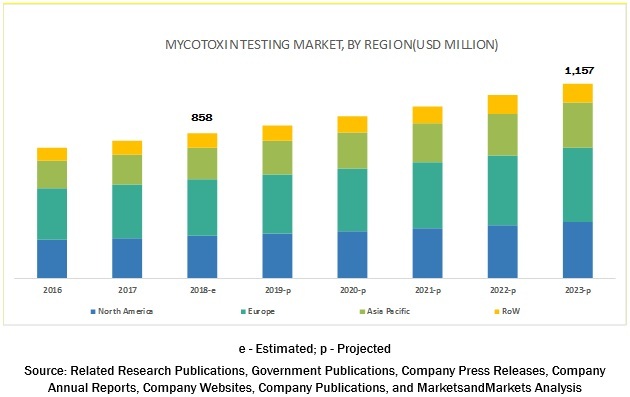 The growing prevalence of Fusarium toxins, due to the changing climatic conditions, is also fueling the mycotoxin testing market. 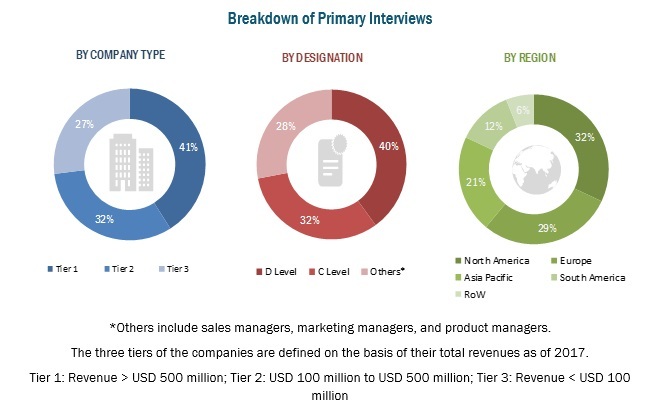 The key players profiled in the mycotoxin testing market include SGS (Switzerland), Bureau Veritas (France), Eurofins (Luxembourg), Intertek (UK), Mérieux NutriSciences (US), ALS Limited (Australia), Neogen (US), Romer Labs (US), Symbio Laboratories (Australia), OMIC USA (US), AsureQuality (New Zealand), and Microbac (US). These companies are focusing on strategies such as new service, technology, product launches, expansions & investments, acquisitions, agreements, collaborations, mergers, and partnerships to expand their operations across the globe. In November 2018, SGS (Switzerland) acquired Digicomply, a content management platform, which would make use of the expertise of the food compliance teams within SGS to sort and classify food compliance data to be made available to users. In June 2018, Bureau Veritas (France) added a highly sophisticated analytical service for "residues and contaminants" in food & beverage samples within its food and water testing laboratory. Some of the services offered include analysis of various food contaminants: residues and chemical constituents of concerns such as pesticides and antibiotic residues, mycotoxins, GMOs, allergens, growth promoters, food adulterants, packaging material hazards, environmental contaminants, and other chemicals. In November 2018, Eurofins (Luxembourg) acquired Spectro Analytical Labs Ltd. (India), a leading food, agriculture, and environmental testing company with the aim of significantly enhancing its market position in this geographical region. What are the growth opportunities for the mycotoxin testing market? What are the major technologies used in mycotoxin testing and disrupting technologies? What are key factors affecting the market dynamics? What are the various types of mycotoxins that are tested in food and feed samples? What are the key patents filed in the field of mycotoxin testing? What are some of the major challenges and restraints that the industry faces? The study involves four major activities to estimate the current market size for mycotoxin testing. Exhaustive secondary research was done to collect information on the market, the peer market, and parent market. The next step was to validate these findings, assumptions, and estimates with industry experts across the value chain through primary research. Both the top-down and bottom-up approaches were employed to estimate the complete market size. Thereafter, market breakdown and data triangulation were used to estimate the market size of segments and subsegments. In the secondary research process, various secondary sources (such as directories and databases)—Hoovers, Bloomberg BusinessWeek, and Dun & Bradstreet (which acquired Avention)—to identify and collect information useful for the study of the mycotoxin testing market. These secondary sources included annual reports, press releases & investor presentations of companies, white papers, certified publications, articles by recognized authors, gold standard & silver standard websites, food safety organizations, regulatory bodies, trade directories, and databases. The market includes several stakeholders in the supply chain—testing equipment suppliers, service providers, R&D institutes, and end-product manufacturers. The demand side of the market is characterized by the presence of importers/exporters and manufacturers of food and feed. The supply side is characterized by the presence of key providers of mycotoxin testing services. Various primary sources from the supply and demand sides of both markets have been interviewed to obtain qualitative and quantitative information. After arriving at the overall market size using the market size estimation processes as explained above—the market was split into several segments and subsegments. To complete the overall market engineering process and arrive at the exact statistics of each market segment and subsegment, the data triangulation, and market breakdown procedures were employed, wherever applicable. The data was triangulated by studying various factors and trends from both the demand and supply sides. Along with this, the market size has been validated using both the top-down and bottom-up approaches. This research report categorizes the mycotoxin testing market on the basis of type, technology, sample, and region.